Secure Investment Management (SIM) offers institutional-quality growth and income strategies for individual investors. ​Performance is the key ingredient but knowing where and how yoru assets are invested is essential for peace of mind. Secure Investment Management (SIM) is an independently owned, SEC Registered investment advisory firm that has core values centered on integrity and trust. It’s our mission to help you succeed with a financially secure and enjoyable retirement. We aim to help you achieve your financial goals with minimal risk and volatility, and we strive for your experience with us to be enjoyable, comfortable and profitable. It’s our calling to thoroughly educate you about your options and to help you choose what’s best for you. Our team of advisors and portfolio managers are experienced, skilled, well educated and ethical. Getting to know you is our most important goal. Our team is trained to listen first. We want to understand your financial goals, thresholds for risk and even what you like to do in your spare time. After all, how can we effectively manage your money if we don’t know you? HOW IMPORTANT IS IT TO MEASURE YOUR INVESTMENT RISK? We provide you FREE OF CHARGE with an investment analysis compare your Risk Profile with your current investments. This example is a client who was invested in stocks, bonds and mutual funds who came to us asking for a second opinion. We asked the client to take a RISK ASSESSMENT and found the client scored 39 out of 100, which meant the amount of risk they were comfortable with. 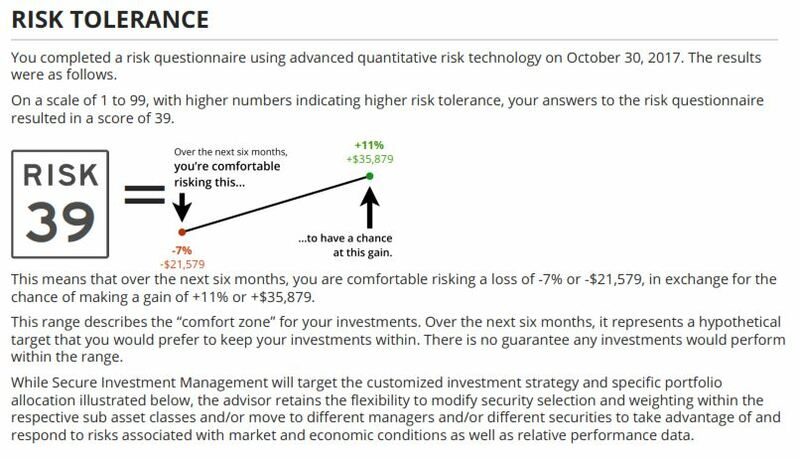 Next we Analyzed the clients portfolio and found that their risk of current investments was scored 81 out of 100 which was a lot more aggressive then the client realized. We worked with the client to realign their investments to better match their risk tolerance then they had prior. Our approach to investing is based on trend following, relative strength and risk management disciplines. That may sound complicated, but don’t let the technical language intimidate you. The process is simple and easy to understand. Trend following is a technique that analyzes security prices over varying time frames. Generally, portfolio managers use short, intermediate- and long-term time frames to measure trends. Imagine you are analyzing a collection of securities. A trend follower would rank the list of securities by price performance over specific time frames. He or she might set the time frames at 1 month, 3 months and 6 months to determine which securities performed the best in these periods and invest accordingly. It’s like analyzing baseball player batting averages for certain time frames and choosing the best hitters. Investors mistakenly believe that brokers are required to put their clients' interests first. They are not. ​Brokers are ultimately salespeople who are generally compensated by commission, or a production based bonus, and whose primary loyalty is to their employers. A fiduciary is a person or legal entity, that has the power and responsibility of acting for another in situations requiring total trust, good faith and honesty. The fiduciary duty is the highest standard of care. It entails always acting in the beneficiary's best interest, even if doing so is contrary to their own interest. For a financial advisor, this may mean recommending a product that results in reduced or no compensation because it's the best option for the client.